You turn out the lights when you leave your home office, and your computer is configured to go into standby mode, but what about all those peripherals? From PC speakers to printers, home offices continue to leak power even when equipment is supposedly in “off” or standby mode. Altogether, your office equipment may be consuming 30 watts of power when you’re not even there, says American Power Conversion (APC). Those losses, which continue seven days a week, 365 days a year, cost on average about $26 per year in wasted energy — and push about 40 pounds of greenhouse gasses into the atmosphere. APC’s Back-UPS ES 750with master-controlled outlets puts a stop to that by automatically cutting power to peripherals when your desktop or laptop goes into low-power mode. You attach your PC to the master outlet. When the PC goes into standby mode, the UPS detects the power drop and cuts off power to three controlled outlets. 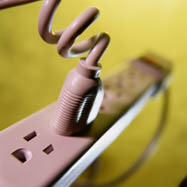 The master outlet can be set to trip when power drops below 10, 25 or 60 watts. The 450-watt UPS is also power-efficient in its own right. It draws just 2.5 watts of power when trickle-charging the battery, which amounts to about $2 a year in electricity costs, APC claims. The new ES 750, which shipped in mid-November, will sell for $99 — the same price as the current BE750BB model. APC also plans to introduce a power strip with a master controller feature early next year.